VP of Sales and Service providers, MEA, CommScope, Femi Oshiga, has stated that operators need to figure how they monetize use cases in order to accelerate the deployment of 5G. Operators appear thus far to be cautious before making huge investments in the required 5G infrastructure until they're assured that they will reap the returns of the capital invested. Telecom Review managed to secure an exclusive interview with the CommScope executive at 5G MENA in an effort to find out some of the latest solutions and technologies the company was showcasing, his predictions on 5G and the challenges currently facing operators attempting to commercialize 5G networks in the MENA region. Can you tell us about some of the new technologies and solutions that CommScope is showcasing here at 5G MENA? 5G MENA is an event which focuses on the future and specific technologies which help us plan for it. CommScope is showcasing our innovation around in-building wireless. We're talking about solving customer problems, highlighting the benefits of two products, one is called the 'Era' which is basically a digital DAS platform. We think operators are showing more and more interest in it as they invest more in the indoor space given around 80 percent of cellular data sessions originate or terminate inside a building. It allows them to either make a direct investment or allows the enterprise to invest directly; either way it gives them flexibility. Network operators can host remotely in a cloud-like architecture - this is a new offering we're providing customers. That is why we decided to show that here at 5G MENA. We're also showcasing a similar solution, which is a small cell solution. It's different because it is actually a radio on its own that connects directly to an operator's network. It presents a different type of use cases, but because it's self-optimizing, no design and planning are required and it's very easy to deploy. Operators are really considering this solution too. With more and more traffic coming from in-door they have to have backhaul solutions to deploy. In your expert opinion, what are the biggest challenges currently facing operators that are trying to commercialize 5G networks in the Middle East? I just came out of one the panel discussions here at 5G MENA, and something that you hear over and over at these types of events is the theme of use cases. There are plenty of very interesting use cases, but what exactly are the money generating use cases? We're excited as we see a lot of use cases, but the operators really need to figure out how they can monetize it. But what's even more interesting for us, and whilst we conceded that it is a challenge, operators really need to do a lot of infrastructure investments - and we are 'the' infrastructure network connectivity company. We're hoping that operators will come to us when they have fiber requirements or fiber connectivity requirements and upgrade the antennas on their site and when they want to densify with metro cells. We have a whole suite of solutions and can offer them all the pieces of equipment they need to provide the underlying infrastructure to start with. To be honest whether that's 4G, 4.5G or 5G there's a lot of investment required for that to happen in that space. One of the panelists talked about how if only 25 cities in the US were to go 5G, they would have to invest in 1.3 million miles of fiber which represents an investment of $50bn. CommScope is a key player in the fibre industry and that's just 25 cities so you can see the incredible opportunities the emergence of 5G is going to bring. What key areas should service providers focus on when seeking to take advantage of this 'wireless transformation' that will be accelerated by 5G deployment? The fundamental practices are so important and it's a message we're always stressing to our partners. I believe there are three key areas that service providers have to focus on. Firstly, site acquisition is critical. What's clear is that when you're building sites, they have to be small, simple, fast and aesthetically pleasing in order to deploy as many of that is needed for 5G. You can place these sites that are virtually invisible to the eye when you walk down the street - but provide capacity in areas where they are required. Secondly, backhaul is important - we're trying in everything we do to provide solutions for backhauling traffic to a central office - from site locations whether they are metro cells or macro cells or in-building sites. The third fundamental is power. We imagine building all these sites and we just assume the power is available, but they're not - they're not always available. The requirement for power at every wireless access point is essential, but often assumed as available or even forgotten until the completion of network planning. So site acquisition, backhauling and power are the fundamentals that service providers have to focus on. Can you highlight some of the key projects CommScope is set to embark on in 2018? We're trying to align ourselves with the big projects around the region such as the Saudi 2030 vision. Other markets are taking advantage of wireless transformation. For example, South Africa, Morocco and Egypt are also investing in fiber. There are several other opportunities out there and we're trying to ensure that we have a stake in all of them. What differentiates CommScope from its competitors? We're a quality vendor and we don't compromise our quality for a quick sale. We're very focused on the total cost of ownership for the operator. This pays off in the long run and that's why CommScope was recognized as a 2018 top 100 global technology leader by Thomson Reuters. We also have a principle called the 'trusted advisor' which means we're focused on solving customer problems through innovation. It is not enough to know who your customer is. You must join their team, understand their strengths, weaknesses and key players. This claim is backed up by Forrester who says, "68% of customers want vendors who "understand my business, my problems - and help me solve them." How important is an event like 5G MENA for CommScope? Does it represent a good networking opportunity for your organization, or is it a good platform for you to generate more business leads? I think 5G MENA certainly goes beyond just networking. It gives us a great opportunity to meet with potential customers and our key partners' right across the region. We've seen CTO level attendance from STC and Zain Jordan who are positioning their organisations as keeping pace with transformation. There are also a lot of vendors present and that gives us an opportunity to speak to them and find out what they're doing from a technological perspective. It's a key event that goes beyond handshaking. Can you outline to us what your primary objectives and goals are for the rest of 2018? We are focused on empowering customers' digital transformation projects which are commencing across the region. Constant change is the status quo. 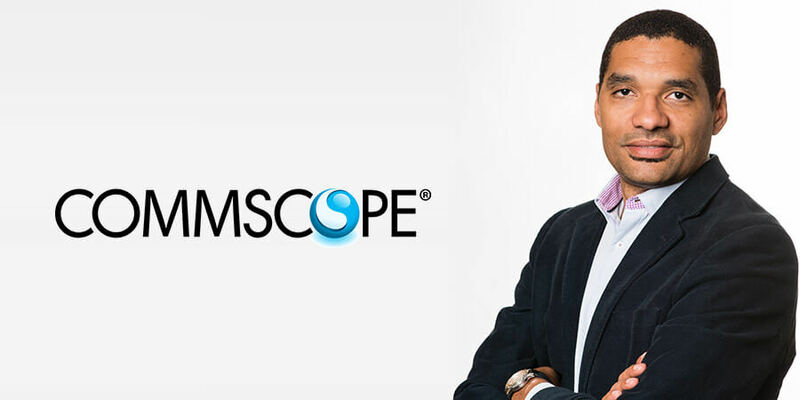 CommScope is focused on helping the Middle East and Africa adapt to change. In places like the United Arab Emirates (UAE), the government is reimagining what transportation and education will look like in the future. They've appointed the world's first Minister for Artificial Intelligence and more than half a million people from 22 countries have applied to participate in the One Million Arab Coders programme. My colleagues and I are debating whether or not flying cabs may soon be a reality.